4-coumarate: coenzyme A ligase (4CL) is an essential enzyme in lignin biosynthetic pathway, converting p-coumarate, caffeate, and ferulate into their corresponding CoA esters [2, 5]. The 4CL family is a small and conserved gene family, playing a critical role in the biosynthesis of phenylpropanoid metabolites . The 4CLs can be divided into two major subgroups: one group is mainly responsible for lignin biosynthesis; the other group is involved in flavonoid biosynthesis . In Arabidopsis, three 4CL isoforms, namely At4CL1, At4CL2, and At4CL4, participate in lignin biosynthesis, and At4CL3 are responsible for flavonoid metabolism . Moreover, five 4CL isoforms have been characterized in rice and each isoform shows different substrate affinities in vitro . Suppression of Os4CL3 in rice leads to lignin reduction and impacts plant development and growth . Similarly, downregulation of Pv4CL1 and Sh4CL1 reduces lignin content in switchgrass and sugarcane [9–11]. Site-directed mutagenesis of Pp4CL1 characterizes the function of conserved amino acids, providing an insight in understanding the relationship between structure and function of 4CL proteins in Peucedanum praeruptorum . The spontaneous brown midrib (bm or bmr) mutants in maize, sorghum, and pearl millet exhibit brownish midribs, associated with impaired lignin biosynthesis . To date, at least six maize bm mutations (bm1-bm6) have been identified and four of them have been characterized [14–17]. The loci of maize bm1 and bm3 encode the cinnamyl alcohol dehydrogenase (CAD) and caffeoyl-O-methyltransferase (COMT), respectively, which are crucial enzymes in the lignin biosynthetic pathway [14, 17], whereas the loci of bm2 and bm4 are responsible for the biosynthesis of methyl donor required for the biosynthesis of both guaiacyl (G) and syringyl (S) monolignols [15, 16]. Moreover, two sorghum bmr loci have been identified including CAD (bmr6) and COMT (bmr12 and bmr18) . 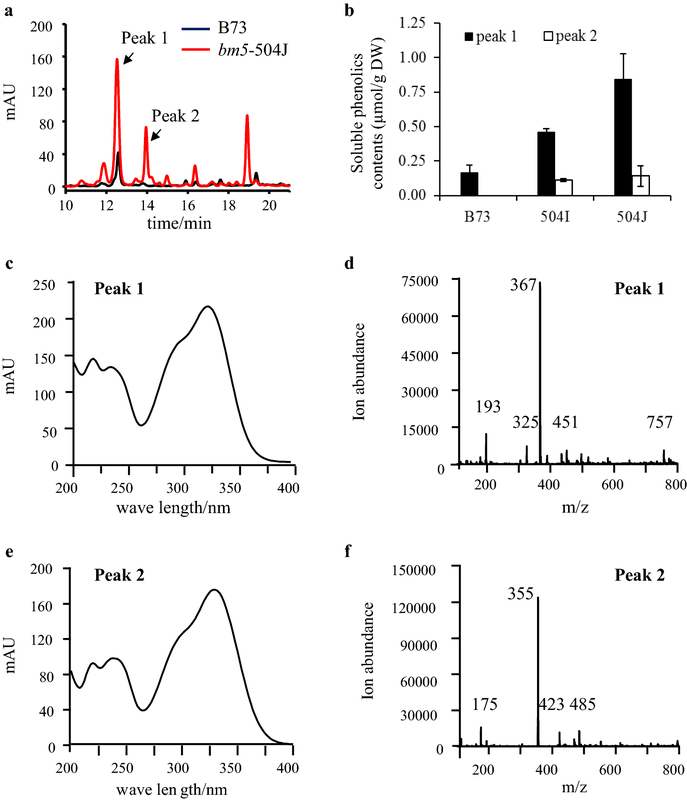 Recently, sorghum Bmr2 has been identified to encode a major 4CL . The corresponding bm mutant in maize, however, has yet to be found. 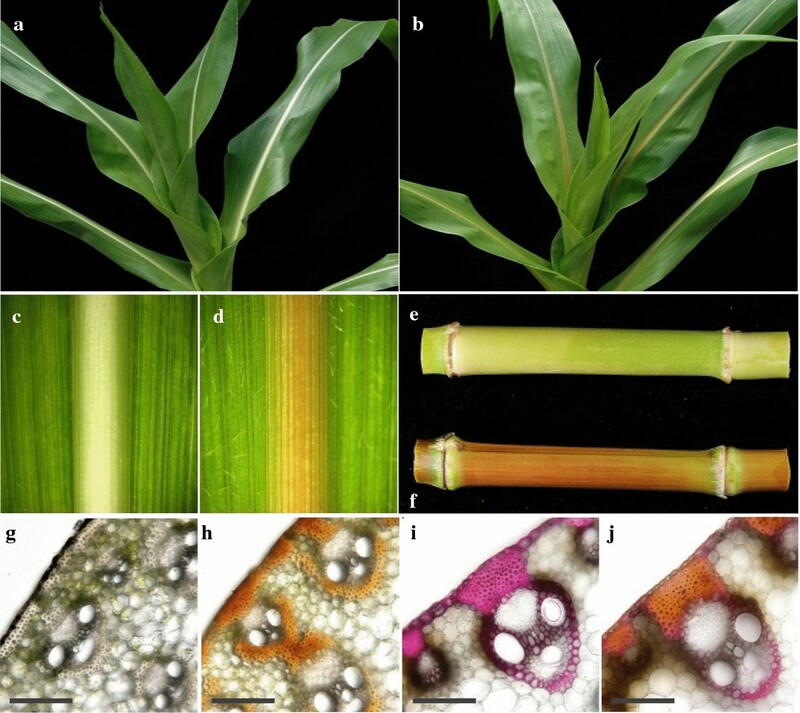 The bm mutants associated with dramatic changes in lignin content and/or composition are of great interest to improve agro-industrial properties of corn stover. For example, a typical successful case was the commercial utilization of bm3 mutant that has a high forage digestibility . Thus, the characterization of novel bm mutations will shade light on the molecular mechanism of lignin biosynthesis, which may lead to produce more valuable sources for breeding new germplasm of forage and biofuel crops with high cell wall digestibility. 13068_2019_1421_MOESM1_ESM.docx Additional file 1: Table S1. The SSR markers used in this study. 13068_2019_1421_MOESM2_ESM.xlsx Additional file 2: Table S2. SNPs with SNP-index 1 within the candidate genomic region detected on chromosome 5. 13068_2019_1421_MOESM3_ESM.docx Additional file 3: Fig. S1. Insertion sequences of the Zm4CL1 in bm5 mutants. 13068_2019_1421_MOESM4_ESM.docx Additional file 4: Table S3. Primers used in this study. 13068_2019_1421_MOESM5_ESM.docx Additional file 5: Fig. S2. The 4CL activity of soluble protein extracts containing Zm4CL1 and the truncated Zm4CL1 mutants. 13068_2019_1421_MOESM6_ESM.docx Additional file 6: Fig. S3. Phylogenetic analysis of 4CLs in vascular plants. 13068_2019_1421_MOESM7_ESM.docx Additional file 7: Table S4. Expression levels of Zm4CL genes in maize different tissues. 13068_2019_1421_MOESM8_ESM.docx Additional file 8: Fig. S4. Transcriptome analysis of bm5 mutant by microarray. 13068_2019_1421_MOESM9_ESM.docx Additional file 9: Table S5. 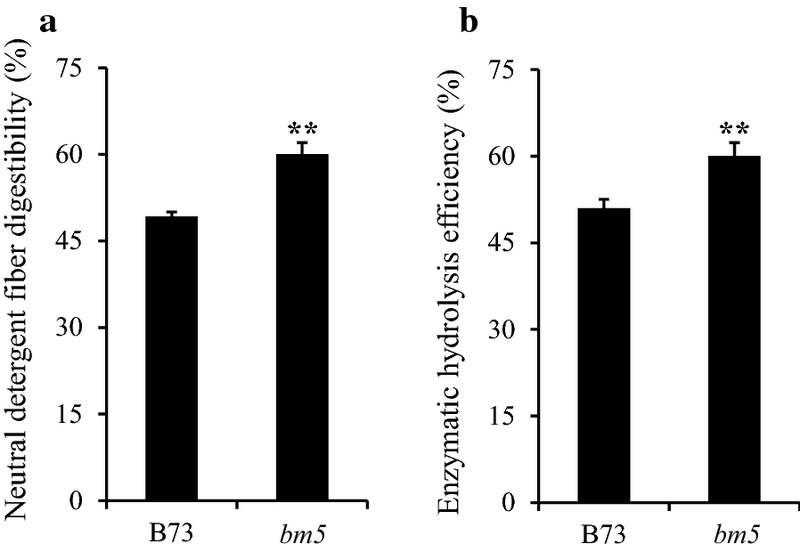 Signal intension of the probe sets of regulated genes in bm5-504J mutant and B73 wild-type plant. 13068_2019_1421_MOESM10_ESM.docx Additional file 10: Table S6. Signal intension of the probe sets of lignin genes in bm5-504J mutants and B73 wild-type plants. 13068_2019_1421_MOESM11_ESM.docx Additional file 11: Fig. S5. Expression levels of other 4CL paralogs in bm5 mutants. 13068_2019_1421_MOESM12_ESM.docx Additional file 12: Table S7. Lignin content and composition of bm5 mutant. 13068_2019_1421_MOESM13_ESM.docx Additional file 13: Table S8. LC–PDA–ESI-MS/MS identification of soluble phenolics in methanolic extracts from midribs of the bm5 mutant. 13068_2019_1421_MOESM14_ESM.docx Additional file 14: Fig. S6. SDS-PAGE analysis of recombinant AtUGT84A1, ZmUGT84A-1, and UGT84A-2 proteins. 13068_2019_1421_MOESM15_ESM.docx Additional file 15: Fig. S7. The characterization of UDP-glucoside transferase forming glucose ester with ferulate in vitro. 13068_2019_1421_MOESM16_ESM.docx Additional file 16: Fig. S8. 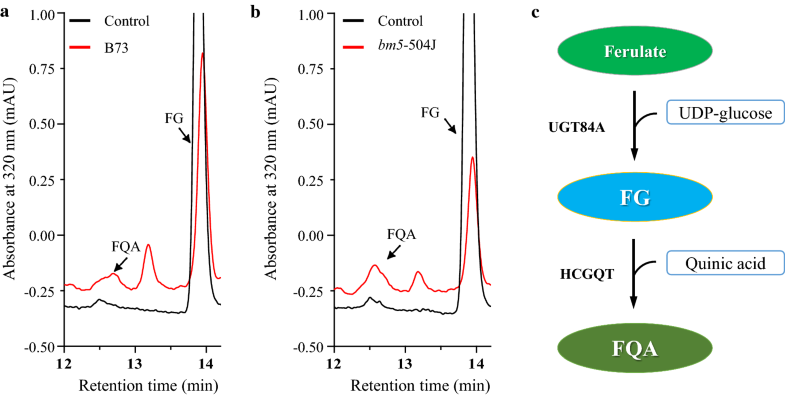 The biosynthesis and characterization of FG and FQA in vitro. 13068_2019_1421_MOESM17_ESM.docx Additional file 17: Fig. S9. UV–visible spectra of the remarkably accumulated products formed after adding FG into the crude extractive proteins from B73 and bm5-504J mutant. 13068_2019_1421_MOESM18_ESM.docx Additional file 18: Table S9. 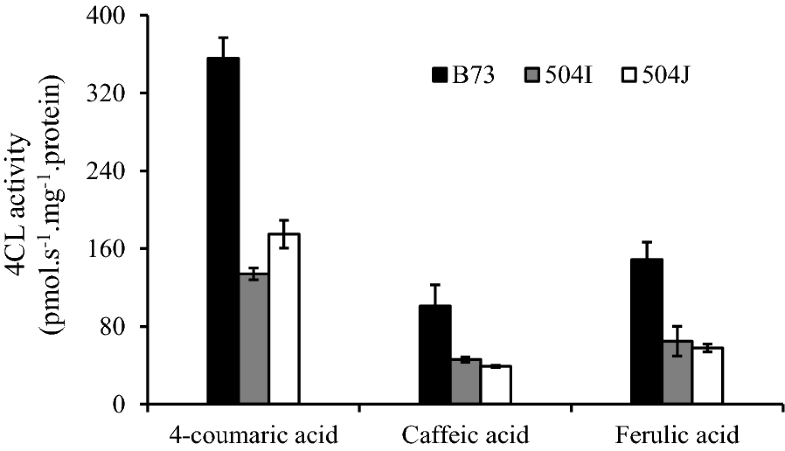 ADL, hemicellulose, and cellulose contents of bm5 mutants and B73 wild-type plants.